The IBM® System Storage® DCS3700 consists of IBM System Storage DCS3700 storage subsystem and IBM System Storage DCS3700 expansion unit. The DCS3700 features the latest technologies, including 6 Gbps SAS and 8 Gbps Fibre Channel host interfaces, along with 6 Gbps SAS drives. The DCS3700 also features a 10 Gbps iSCSI host interface with an optional Performance Modules system. The DCS3700 provides a simple, efficient, and flexible approach to storage that is based on seven generations of design knowledge and firmware development. The DCS3700 can act as a cost-effective and fully integrated complement to IBM System x® servers, IBM BladeCenter®, and IBM Power Systems™ for various intensive computing environments. 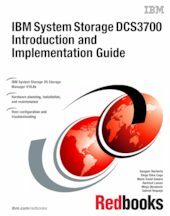 This IBM Redbooks® publication specifically addresses the hardware features, configuration, and implementation of the DCS3700. It presents detailed descriptions of the hardware configurations and options that are offered with the DCS3700. It then presents the concepts and functions that are used in planning and managing the storage subsystems, such as multipathing and path failover. This book offers a step-by-step guide to using the IBM Storage Manager to create arrays, logical drives, and other basic (and advanced) management tasks. This publication also contains practical information about diagnostic tests and troubleshooting, and includes practical examples about how to use scripts and the command-line interface (CLI).